Have you always wanted to learn the pipes or drums? 2018 - Our 18th year! The Grand Celtic Pipe Band is a competitive Grade 5 pipe band located in Fergus, Ontario. We are a community based organization with pipers and drummers in the county coming together to form a competition and performance pipe band. We work to continue to develop the skills to keep this music alive, and offer free tuition to any willing person who has a desire to pick up a snare or bass drum, work on a tenor, or play the Great Highland Bagpipe. We have a formed a strong, multi-generational band that strives to deliver strong music played well. This is our 18th year competing, and we keep learning, developing, and striving to deliver a great product from the Celtic spirit of family, friendship, and community. Our neighbours, the Fergus Pipe Band, are another great group of people, and you will often see both the Grand Celtic Pipe Band and the Fergus Pipe Band out and about in the community together. You'll be able to tell us apart by the difference in our tartans: ours is a vibrant coral red with green and blue through it; the Fergus Pipe Band sports a classic Modern MacKenzie. Be sure to come say hi the next time you see us out on the town! If you are interested in joining the band, drop into a practice. Contact us to find out when and where our next rehearsal will be! 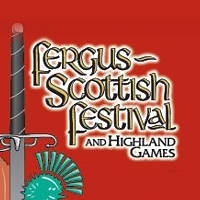 The Fergus Highland Games (our own home town games) has long been a valued member of the Scottish games tradition. From the Heavy Events, the dancing, the Tattoos, and of course the big pipe bands - in competitions as well as Mass Bands - we love it all. And this games has always been there. Since 1946, in fact. That's a long time. And the Grand Celtic Pipe Band would like you to know how much we appreciate their commitment to keeping the Arts of Scotland alive. Our kids love the games. Our parents and grand-parents love the games. And we love the spirit, the camaraderie, and the good friends we all make when we visit the games. As a group, we would very much like you all to know that we value (very highly) the commitment that these volunteers have towards maintaining and promoting a venue that supports the continuation of a heritage that not many people participate in. Honestly, how many folks do you know that toss a caber, or dance a Fling, or pipe and drum in competitions? And so we thank them. Visit their site and have a look. Just click on their logo. Oh... And as a secret, this year's event is being restructured to offer more and with more focus on what you want to see at a games - but that's a secret for now, and details will follow. Be sure to visit often to see what they have in store! And we'll see you in Fergus the second weekend in August. There’s a pipe band in Fergus, Grand Celtic it’s called. Its members they rank from the young tae the auld. MacDonald the P. M. is Calum by name. The band bears the tartan of the same. And we now number forty-two. Embro and Georgetown are games to compete. That’s how we earn our dough. “It’s Grand Altogether” our motto as such. Jigs and slow airs we like very much. But we’ll master them some way. Strike up the drones and practice the score. For we’re not perfect yet. From a lively jig through a hymn. We’ll greet you with pleasure and glee. And toast one and all Slaint give vach.